North Korea's leader called President Donald Trump "a frightened dog" and a "gangster fond of playing with fire" in an official statement released Thursday. Kim Jong Un responded to Trump's United Nations speech in a dispatch written in the first person. 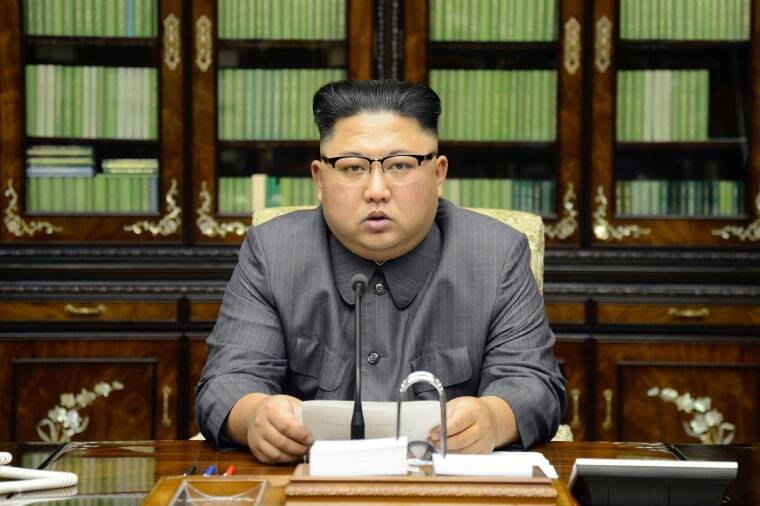 South Korea's government said it was the first such direct address to the world by any North Korean leader. Hours later, North Korea's foreign minister reportedly said his country may test a hydrogen bomb in the Pacific Ocean to fulfill Kim's vow to take the "highest-level" action against the United States. Trump hit back Friday morning on Twitter. "Kim Jong Un of North Korea, who is obviously a madman who doesn't mind starving or killing his people, will be tested like never before!" he wrote. Trump, during his speech on the U.N. floor on Tuesday, threatened to "totally destroy" North Korea if the United States were "forced to defend itself." Kim, whom Trump has recently started deriding as "Rocket Man," said the threat had not fallen on deaf ears. "I will make the man holding the prerogative of the supreme command in the U.S. pay dearly for his speech calling for totally destroying [North Korea]," he added. In his bellicose statement Thursday, Kim also repeatedly referred to Trump as a "dotard" — an arcane term for a senile or weak-minded elderly person. Trump announced on Thursday that he planned to sign an executive order that would slap sanctions on individuals, companies and financial institutions that do business with what Trump characterized as "this criminal rogue regime." He said his mission was North Korea's "complete denuclearization." According to South Korea's Yonhap News, Pyongyang may conduct a hydrogen bomb test in the Pacific as a warning to the United States after Trump's latest speech. "It could be the most powerful detonation of an H-bomb in the Pacific," North Korea's Foreign Minister Ri Yong Ho told reporters. "We have no idea about what actions could be taken as it will be ordered by leader Kim Jong Un." Japan, the only country ever to suffer an atomic attack, described that threat as "totally unacceptable." Earlier this month, the U.N. Security Council passed harsh sanctions targeting Kim's nation, which has continued missile tests and aims to expand its nuclear arsenal. The sanctions ban 90 percent of North Korean exports and were approved by Russia and China, who had previously maintained closer ties to North Korea. In his statement, Kim did not mention the sanctions. The statement will further escalate the war of words between Kim and Trump as the North moves closer to perfecting a nuclear-tipped missile that could strike America. In recent months, the North has launched a pair of still-developmental ICBMs it said were capable of striking the continental United States and a pair of intermediate-range missiles that soared over Japanese territory. North Korea has previously embraced racist, sexist and just plain rude statements about its enemies. It repeatedly called one past South Korean leader "rat faced." It has said that the South's first female president, Park Geun-hye, was a "crafty prostitute" and suggested ex-President Barack Obama was her pimp. It also called Obama a "monkey."